Malibu West Beach Club is the perfect place for a beautiful wedding! From the moment we stepped into MWBC we knew that was where we were going to say I DO! Jacqui was just amazing to work with, from start to finish! Wow, her response time was always super fast, and I appreciate your flexibility (night shift nurse here) Everything is brought in by you, and you get a list of amazing vendors that they recommend, and all of ours that Jacqui recommend were just amazing! The views are incredible, we had a dolphin spotted while we were getting ready and a few sea lions too! I couldn't believe what a magical day we had! The moon was full and bright out on the balcony, and the weather was perfect! It was truly a Malibu fairy tail! The space is so beautifully decorated already you don't have to add much, but whatever needs you may have, Christine in the decor department has got you covered! She did our arch and our sand boxes for the table cards, and everything was beautiful. Can't say enough how special our day was, just perfection! Thank you Jacqui and MWBC staff for making our dream wedding a reality! Made the best day of our lives possible! The wedding venue was fantastic for our dream wedding of classy, romantic, able to hold a fair amount of people, idyllic beach location yet still intimate. Christine was accommodating and wonderful! If you're looking for an amazing venue with gorgeous views of the Pacific Ocean, Malibu West Beach Club should be top of your list. We held our wedding there and could not have been happier with the decision. Knowing a majority of our guests would be coming from out of town we wanted to give them something special to remember and MWBC certainly delivered. Working with them was quite easy as they were responsive with their communications and already had some in-house decor that was available to rent. While we opted for some additional lights and other decor, we went minimalistic to emphasize the natural beauty of the venue and backdrop. There was one miscommunication on when we wanted our rental time to begin which cost us a few extra dollars, however our total headcount was below the contracted limit which MWBC graciously provided us with a refund for. Having semi-private access to the beach also made for a fun photo shoot with the bridal party and some epic shots at sunset. 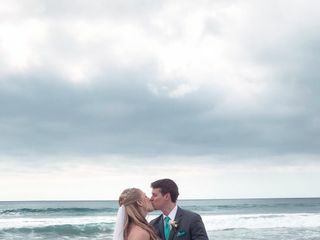 We are so happy we chose MWBC as our wedding venue and would highly recommend it to any couple looking for an amazing place with amazing views! We had a wonderful experience with MWBC. They were quick to respond to any questions, met with us several times, and delivered all they agreed to and then some. The venue is just beautiful and the staff is amazing! Malibu West is a hidden gem. We had our rehearsal dinner on Thursday night and it was half price. The staff couldn’t have been nicer and had a great list of vendors. I cannot say enough about MWBC. It was the most perfect venue to celebrate the best day of our lives. Everything from location, to staffing was beyond my expectations. Everyone was so responsive, professional, gracious and kind from the day we looked at the venue to the minute our wedding ended. Thank you for surpassing our expectations and making our day the best day of our lives. As soon as my husband and I set foot inside, we knew we'd found our perfect venue. 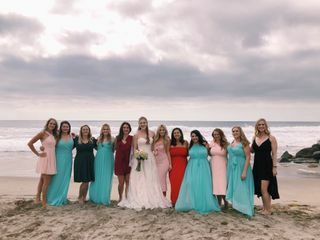 We were looking for a venue that would allow outside vendors, as well as a location near the ocean, so Malibu West was simply perfect for our needs. Not to mention, it doesn't need too much décor - it's already gorgeous on its own, and you can't beat the ocean view. It photographs very beautifully, too. Jacqui was a pleasure to work with from start to finish. Thanks Malibu West Beach Club, for providing the perfect location and backdrop for our special day. 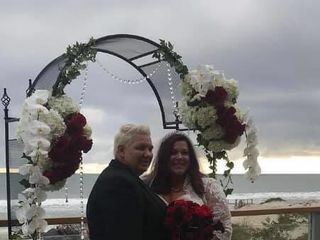 We had a beautiful wedding at the Malibu West Beach Club! The venue was incredible and memorable with a beautiful ocean and sunset view. Jacqui was amazing and so was the rest of the staff! The space was beyond beautiful and the team at MWBC was always so pleasant and flexible. We were so happy with how our wedding turned out and several guests were blown away by this venue. Jacqui was extremely responsive throughout the whole process. Everyone raved about the venue. Although there are additional charges to consider such as valet (only one preferred vendor allowed) charges for using outside caterer and for additional hours, we felt the location and service was worth it! The Malibu West Beach Club is truly amazing. Not only is the venue one of a kind, but the staff is truly amazing! One of the only places with this kind of view at this kind of price. I would recommend this venue to everyone for any type of event. The perfect venue. Location, scenery and service was beyond excellent. I cannot say enough good things about Malibu West! I recently had my wedding here and it was perfect if you want a beach wedding but not on the actual sand. The deck overlooking the ocean made for a BEAUTIFUL backdrop and you really only need minimal decor because of how gorgeous the room is with all of the white draping, string lights and chandeliers. Most of my guests were from out of town, so if you have a destination wedding this place and the stunning ocean views will WOW your guests! The pictures at sunset on the beach are beautiful. I had about 60 guests and fit the space perfectly- I wouldn't recommend a wedding with over 100 guests booking MWBC just because it is a smaller, intimate space. With this venue, you have to hire all of your own vendors, and MWBC had a great selection of preferred vendors - I ended up using Truly Yours for catering and Kreative Hands as my florist. The only downside is that there is no parking so we ended up getting a shuttle service to transport guest to/from a hotel in Calabasas. Jacqui was super quick to answers all my emails throughout the year leading up and Christine set up all my decor on the day of beautifully. Such a nice team to work with! I used the 'bridal suite' at the venue to get ready on the day of, and it worked out perfectly. 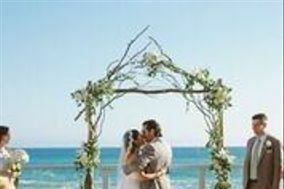 Look no further if you want a perfect SoCal beach wedding! As a photographer I enjoyed this space and the light here - the beach is lovely, the people and staff are excellent and the teams that support this site rock completely. Brides planning a wedding with their crews need to put this venue on the list of must-sees. Versatile, airy, elegant and pretty. It has it all. Decorating is EASY here. nothing to work against at all. This venue is soooooo beautiful and you can do so much with it, even though it's already stunning! Jacqui is really amazing and incredibly helpful and responsive. She made it really easy with a list of vendors, so we didn''t have to worry too much. We booked on a Thursday, so we can have our dream Malibu wedding and be able to afford it. :) I'm a crazy researcher/planner and I must have looked into over 30 venues and only saw this and another one, because my heart was already set on it from the moment I saw it. I'm so excited and can't wait to get married there. Easily one of the best venue to host your wedding / event. If you are looking for a venue with stunning ocean front view and access to the private beach, look no further than MWBC! At the day of our wedding, many of our guest complimented us on how great of a choice we made at picking out this beautiful place and we couldn't agree more! My son and daughter in-law were married at Malibu West Beach Club on March 4, 2017. I don’t even know where to begin explaining how amazing everything was. To start, I have to say that Jacqui is a rock star! She was quick to respond to any questions or concerns that we had from day one. She had great recommendations and was very knowledgeable about everything. The venue is beautiful with its’ beach background. We just got our pictures back from the photographer and wow! They are spectacular. The deck is breath taking! 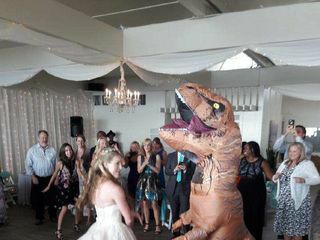 Many of our guests still tell us that it was the best wedding they’d ever been to. The venue is a blank canvas with beautiful chandeliers, great wood floors, and twinkling lights. You can make it as elaborate or basic as you want to fit your budget. We did many of the decorations ourselves, which made it very special. The set up and tear down from their preferred vendors (Command Performance Catering and Diane Carvotta Florist) went very smoothly. The food was outstanding and the flowers were beyond magnificent! This was the first and only venue that we looked at. When you walk through the front doors you are pulled to the deck with a magnificent view of the beach and Pacific Ocean! Book your event at Malibu West Beach Club… I guarantee you won’t be disappointed! Beautiful venue! Would definitely recommend it! Malibu West Beach Club is the perfect California beach venue. All of our guests, whether from out-of-town or from California, were in awe of our venue choice. The deck and the beach make a beautiful ceremony backdrop, and the indoor reception area is decorated with gorgeous white draperies and chandeliers that make any wedding color palette pop. The staff is very helpful and they have great in-house decor options. They provide a list of preferred vendors, and since we mostly stuck to the list, all of our vendors were very familiar with working at the beach club and with each other. I highly recommend using Burlap and Rose coordination, Truly Yours catering and Hollywood DJ for this venue. Our October wedding at MWBC was more perfect than I imagined. Everything was seamless and beautiful, and it was a very perfect day. So happy you were so happy! I heard it was spectacular! We were very happy with how our wedding turned out at MWBC! Jacqui was really sweet and very quick to respond to questions via e-mail. We were concerned about having a live band in this small venue, but it worked out great! We put a stage in the corner of the main room and it was perfect. The great thing about this venue is that you can bring in all your own vendors and customize your wedding however you want. Our favorite vendor was Rachel Wakefield, the photographer. I felt it was important to use a photographer from the venue's preferred vendor list, since he/she would be familiar with the lighting and already know the best shots in the space. She was wonderful! We are so glad we chose to have our wedding at Malibu West Beach Club! Ladies and gentlemen! If you want an amazing wedding venue on the beach, book Malibu West Beach Club. We just had a dream wedding there. I am so happy I booked it for my daughter. It has an intimate setting on the beach with a terrace allowing beach side wedding without being on sand! Everyone loved it; we received many compliments from guests. The club was very helpful throughout the planning process. Jacqui the manager and the staff were the best to deal with. Their help, response, quality service was just first class. The list of vendors Jacqui provided was without hesitation the best with an amazing service. We had a beautiful, lovely wedding with amazing photos on the sand including a sunset above the ocean. So happy with our decision to use mwbc as our wedding venue. From my first email to Jaqui, the entire experience was perfect! Jaqui is incredibly prompt, knowledgeable and thorough in all of her communications! She is pleasant and patient and genuinely wants you to have the perfect wedding! The venue is amazing. You have the gorgeous beach view without requiring your guests to get their shoes all sandy! The venue comes with beautiful chandeliers and white fairy lights throughout that really requires you to do basically no additional decorations! It was perfectly cleaned and ready for our wedding when we arrived. Choosing a venue is one of the most important parts of your wedding and we are SO happy we picked Malibu west beach club!! Malibu West Beach Club is the perfect wedding venue. 1) It's gorgeous. We didn't even need many decorations because the setting is so stunning by itself. 2) Jacqui is so helpful and easy to work with — we took multiple tours of the venue and she was always incredibly accommodating. We also hired our caterer, DJ, and officiant off of her preferred vendors list and they were all fantastic. 3) As Malibu wedding venues go, it's pretty affordable. 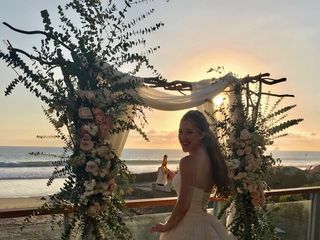 We never dreamed of getting married in Malibu and looked into it on a whim, but Malibu West Beach Club — especially compared to other Malibu and LA venues — is actually reasonable. 4) It's gorgeous. Can't emphasize that enough. We were incredibly lucky to have the wedding of our dreams, and a large part of that is because it was at Malibu West Beach Club. My now wife and I were looking for a wedding venue and we knew Malibu West Beach Club was the one once we stepped inside. Jacqui was very helpful from the start and knew lots of details and planning items that helped a lot. She even had a pre-made list of photographers, catering companies, and more to help us get started much more easily since wedding planning is a lot and stressful. Everyone loved the venue and the wedding went very smoothly. Amazing venue and staff! MWBC is a unicorn wedding venue in SoCal! After months and months of searching for a venue, I had almost given up hope that we would be able to have a wedding here. I *literally* burst into tears when I found this place. 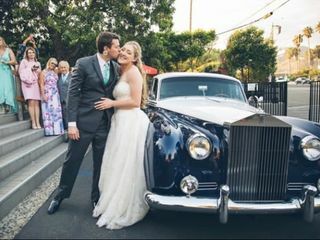 Ours was the definition of DIY wedding-our $15K budget was considered "micro" for Los Angeles. 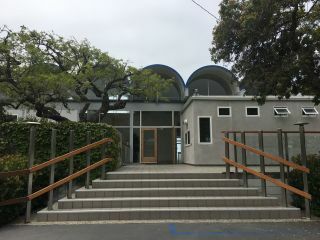 Malibu West offers panoramic, pictueresque views of the Pacific Ocean, twelve hours of time at the space (vs the standard five or six), absolutely lovely decor (re:chandeliers and twinkle lights you don't have to pay extra for! ), and the ability to control costs by bringing in your own alcohol. Jacqui, the site manager, was so helpful and accommodating and walked us through every step. We had the wedding of our dreams and didn't break the bank to do so! I can not recommend MWBC enough!